Argentina was the only South American country to operate regular long-distance intercontinental ocean liners following World War 2, although always with ships of moderate size and speed. Eva Peron and the Argentine State Line. Alberto Dodero is a completely forgotten name in today’s world, but in the mid-20th century, he was the major shipping tycoon in South America. 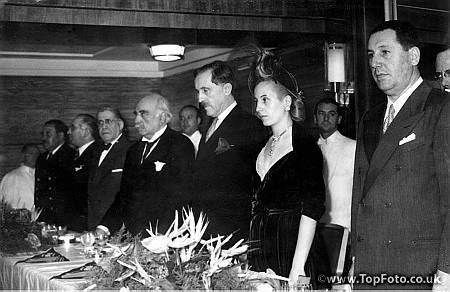 Eva Peron (Evita) with the British Ambassador, Sir John Balfour at a reception aboard the steamship “Eva Peron,” to mark the arrival in Buenos Aires of the ship at the end of its maiden voyage from England. June 1950. Having the advantage of Argentina being neutral, His fortune greatly expanded during World War II with his cargo ships alone bringing a $5,600,000 profit (almost $100 million in today’s dollars) in 1944. However, the greatest move of his career was the backing of Juan and Eva Perón. Showering the Peróns with expensive gifts – diamonds and Rolls-Royces for Evita – he flattered them by wearing gold replicas of their profiles in his lapel. When Perón was elected President of Argentina, Alberto became a permanent house guest at the presidential palace. More than that, Perón directed most government shipping contracts to him, as well as lending him money to buy more ships. 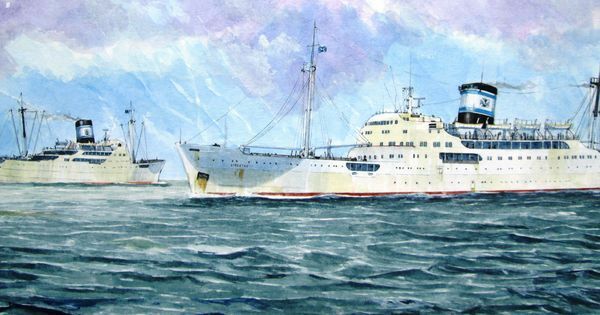 When Peron came to power, Dodero’s shipping lines were in the red, a situation which was not resolved even by being awarded an exclusive government contract to transport 30,000 refugees from Europe at a rate of 600 pesos each. 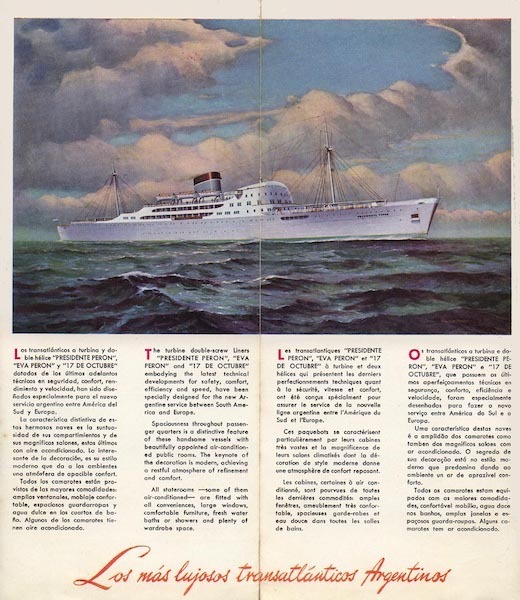 In 1949, Dodero decided to sell the steamship line. It was bought by the government because it provided an essential public service, despite fierce opposition by the Radical bloc in the Senate on the grounds that the company was bankrupt and that its nationalization was designed only to favor its owners, the Dodero family. Argentina was the only South American country to operate long-distance intercontinental ocean liners, although always with ships of moderate size and speed. 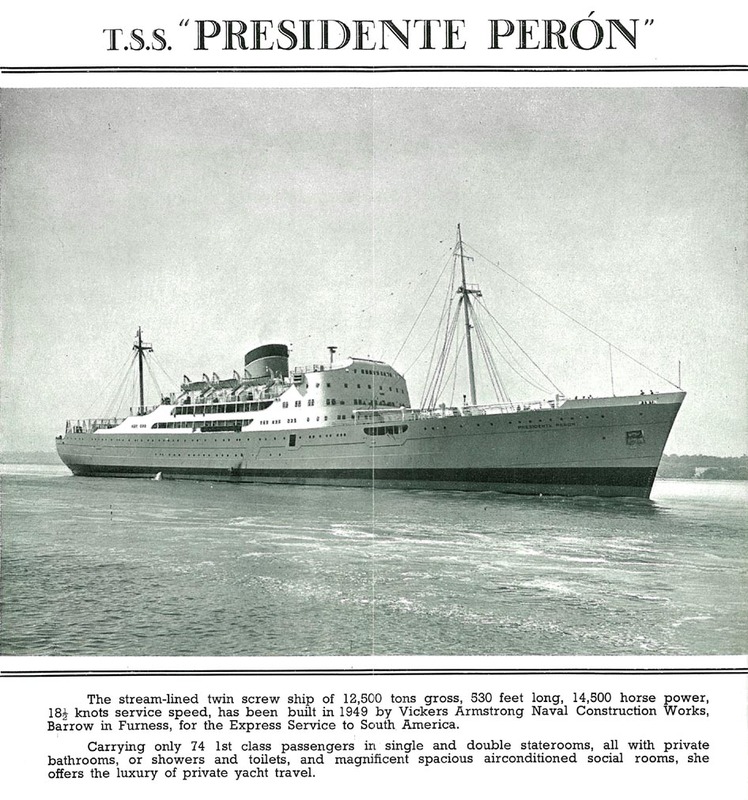 The Juan Peron government was responsible for Compañia Argentina de Navegación Dodero / Empresa Lineas Maritimas Argentinas building new ships and operating first-class passenger service between Buenos Aires and London. 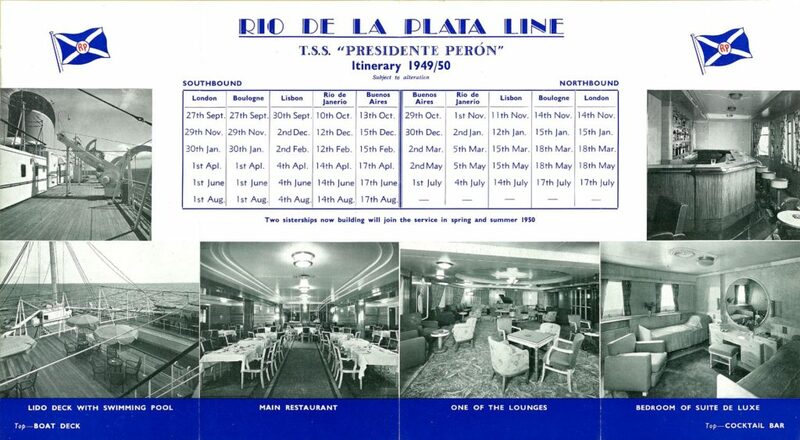 Line voyages began in 1949 with the newly built PRESIDENTE PERON and followed this in 1950 with the EVA PERON and the 17 DE OCTUBRE. 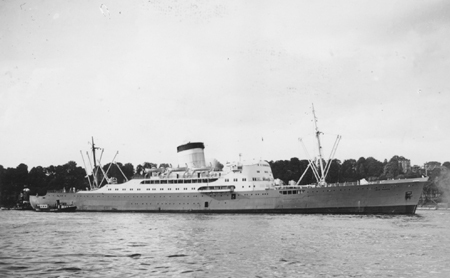 The Flota Mercante del Estado’s motor ship EVA PERON (name adopted in 1952) was launched in 1949. 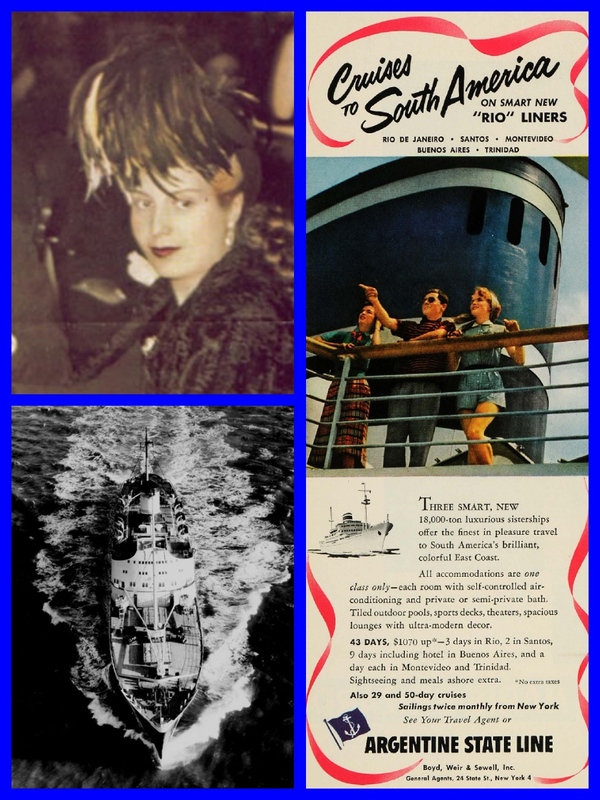 She was one of two ships named after dictator Juan Peron’s wife: Eva Peron. The EVA PERON was 11,317 GRT, 550 feet in length and 65 feet in width. 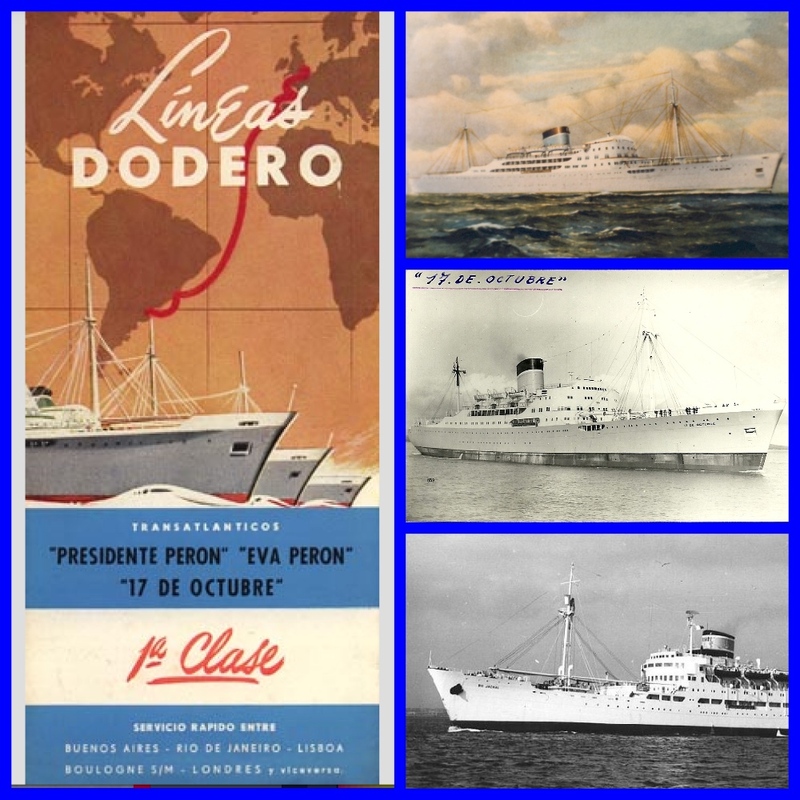 After the fall of the Peron Government, the Dodero Line ceased operations and management of the fleet passed to Flota Argentina de Navegaceon de Ultramar (FANU). In 1962 FANU and the Flota Mercante del Estado merged to form Empresa Lineas Maritimas Argentinas (ELMA) who took over the passenger services. 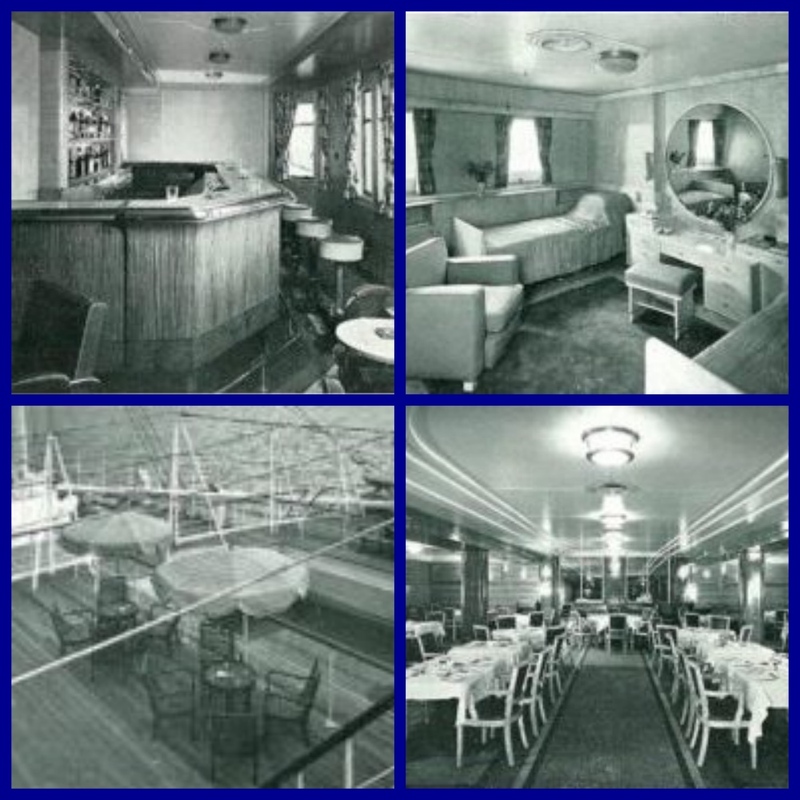 Interiors of the Argentine liners. Argentina operated long-distance intercontinental ocean liners, although always with ships of moderate size and speed. The Rio de la Plata, Rio Jachal, and Rio Tunuyan held down the 41 day round trip from Buenos Aires to New York outbound via Santos, Rio de Janeiro, Trinidad and La Guaira (Caracas), with the homeward voyage stopping in Rio de Janeiro, Santos, and Montevideo. he spacious facilities were designed to compete with Moore-McCormack Lines’ popular “Good Neighbor Trio” built in the 1930s. Argentine State Line’s ships were popular. 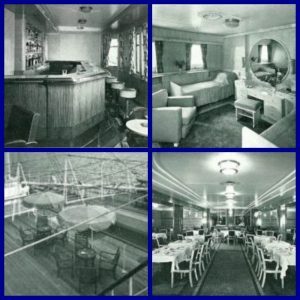 The air-conditioned accommodations included large staterooms with private or semi-private bath, the main lounge, smoking room bar, library, dining room and the tiled swimming pool and lido. 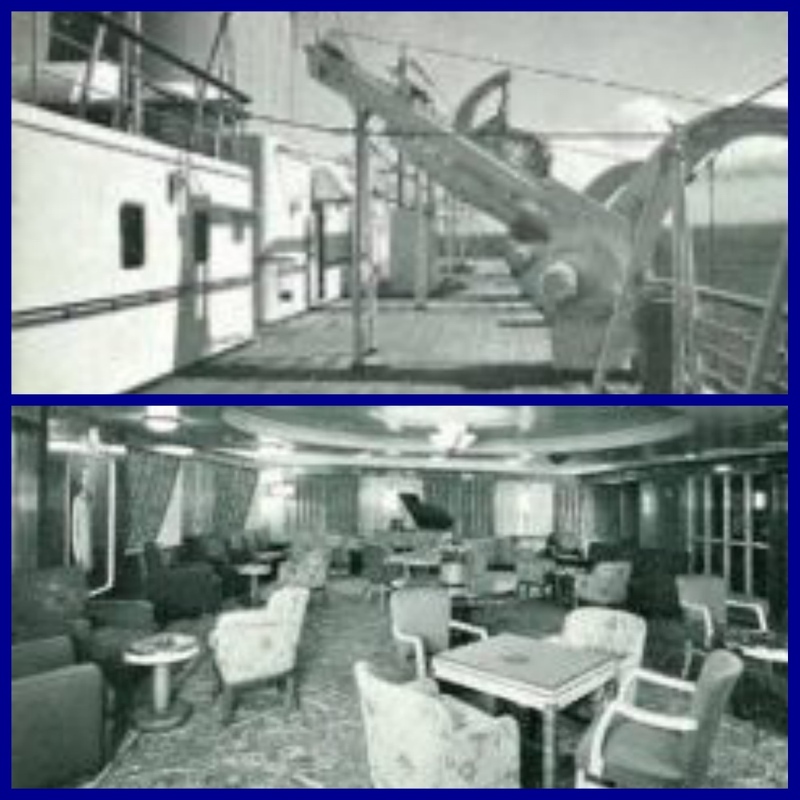 Next: PETER KNEGO, the maritime historian who turned his home into a MID-CENTURY ocean-liner.